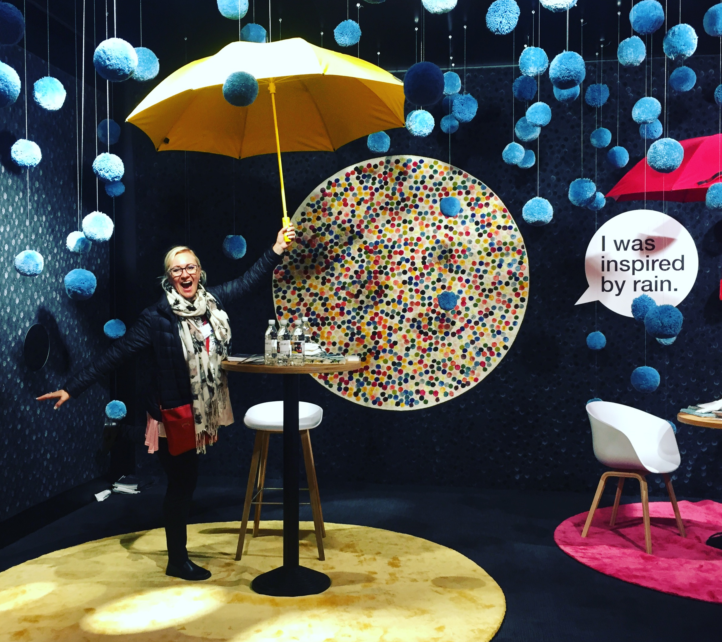 FLOORS in Africa Editor in Chief and Managing Director, Marlene van Rooyen, attended the leading international flooring expo in Hannover in January 2019. Floors are a connecting element that inspires and sets the stage for human interaction, and everyone from artists and designers to consumers focus on quality over quantity. 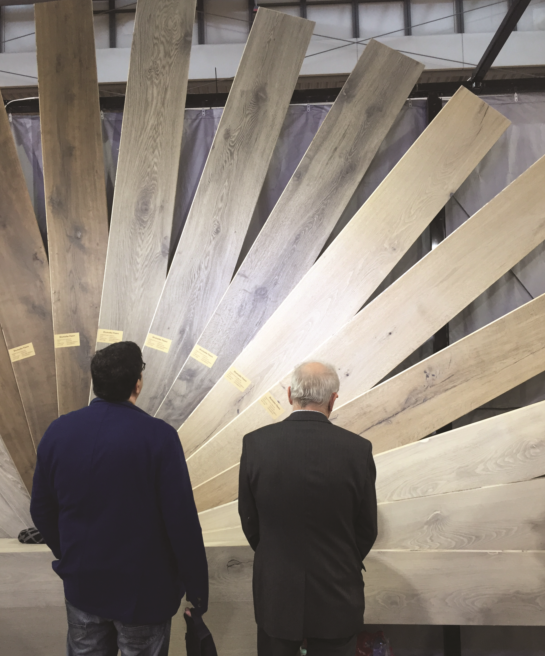 From parquet flooring, hybrid wood protection products, exceptional cork flooring and LVTs made from denim to carpets made from recycled materials that are completely recyclable, DOMOTEX 2019 had something for everybody. In this feature, we look at some of the products that caught our attention at this year’s event. 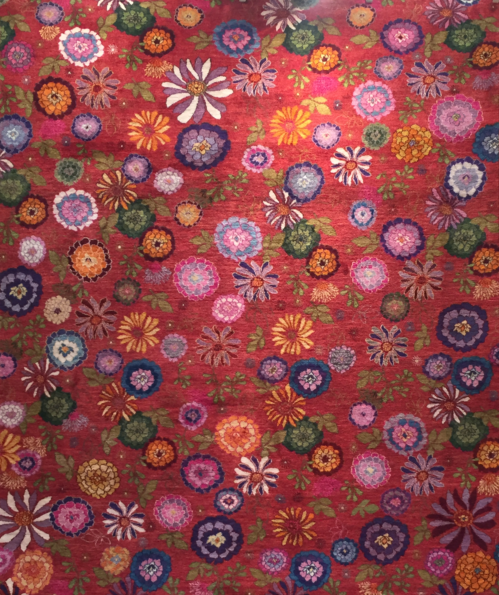 “The vast majority of the exhibitors showcased rugs. Many manufacturers are teaming up with architects and artists for custom designed pieces. It’s all about colour, size, texture and design. 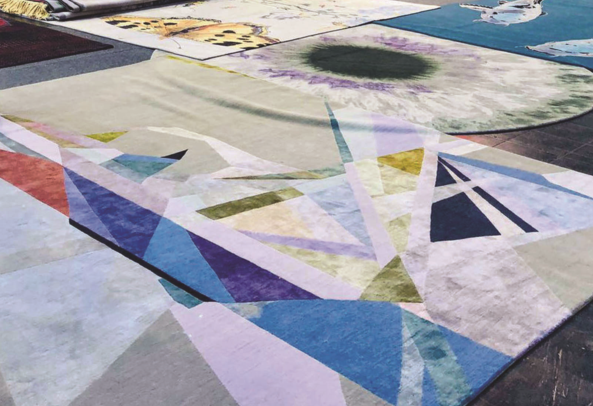 Customisation has become a standard in the industry and manufacturers are giving clients the option to create one-of-a-kind artworks on virtually any size of carpet or rug,” says Marlene. 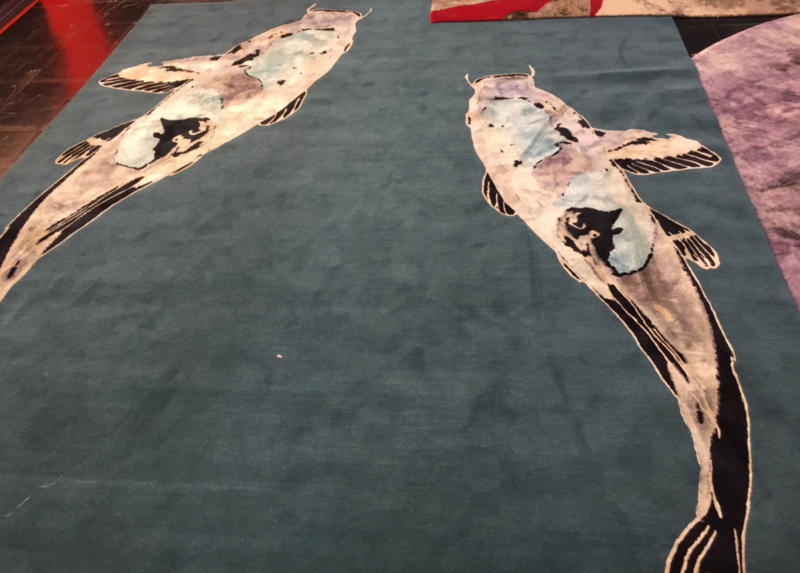 Art Resources takes artwork and transposes it onto rugs. 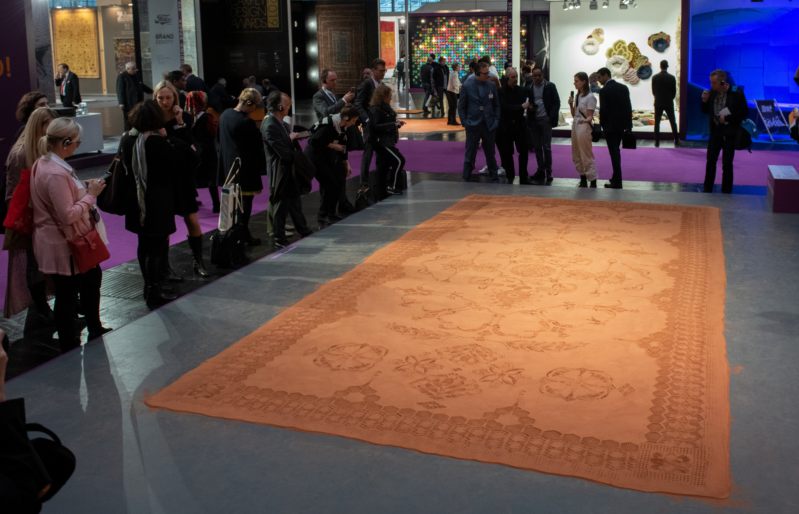 At DOMOTEX, it was obvious that rugs can definitely be the feature of a room, which is a great inspiration for interior designers in 2019. 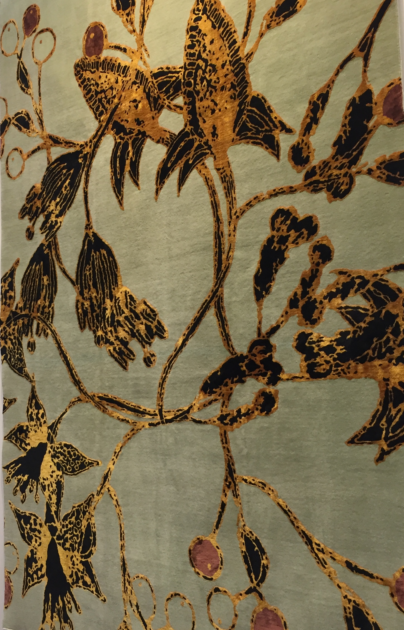 Many of the rugs highlighted Japanese influences such as lotus flowers, koi fish and other Japanese designs. A popular trend is colour washing, as well as geometrics combined with colour washing that bleeds across the borders of carpets. 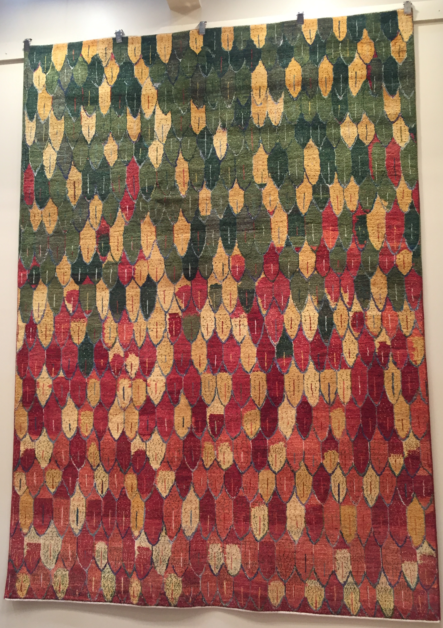 Some of the rug designers combined bold geometric patterns with distressed borders. Leather rugs and carpeting is still a niche market. 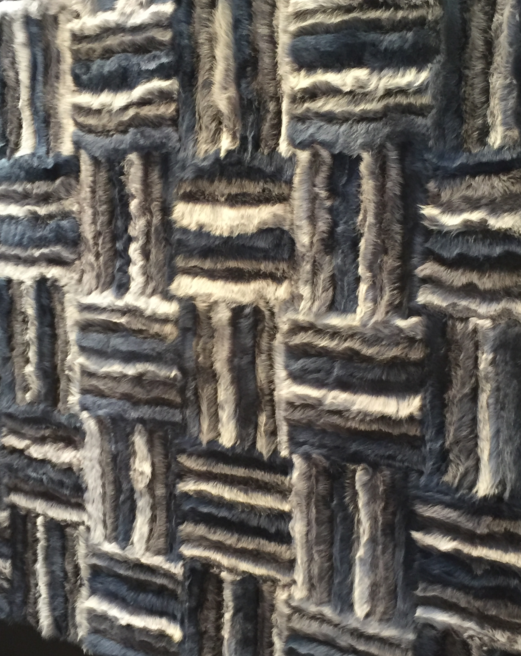 Many of the trendy leather rugs had fur textures on them. Hossein Rezvani Persian carpets are made from silk and showcase electric blue and neon pink designs. Hossein is the only person who can put a million knots into a single carpet. “Hand knotting differs from region to region, so the patterns and colours on the rugs that we saw differed depending on where they were made. Many manufacturers and artists are focused on drawing inspiration from the various regions where the rugs are produced and some of them employ weavers from far-off locations. 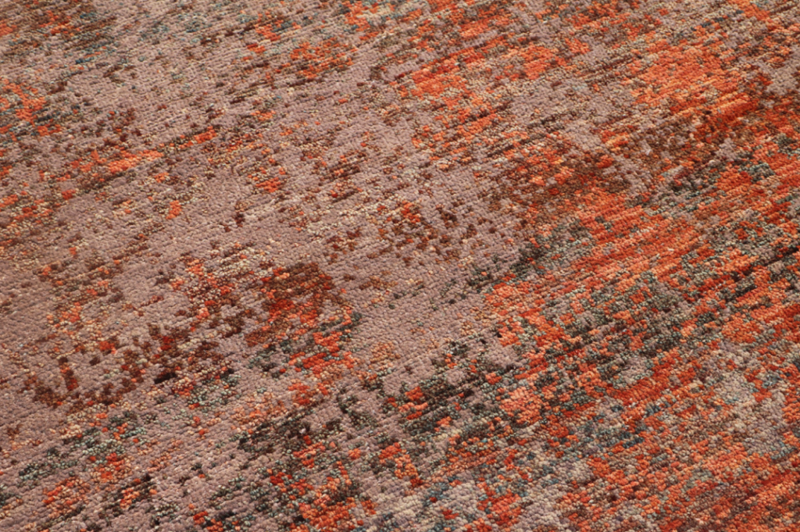 Staying true to the source while using the latest technologies during the manufacturing process helps them create traditional carpets that are suitable for the new era,” says Marlene. 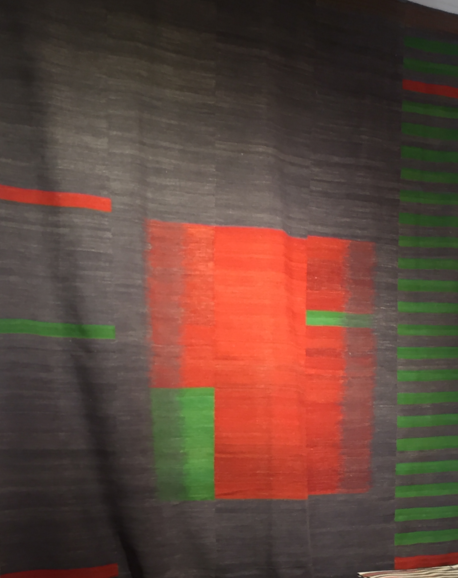 Zollanvari looks at traditional carpets and asks: how can we modernise them for today? Thran’s rug design taps into the area where the rugs were made. The black represents ash, the red represents fire and the green symbolises new growth from spring. Rug Star’s rugs require 3000 working hours per rug. The starting price is €20 000 and customers are happy to pay for the quality craftsmanship and customisation. Tisca’s rugs look like seaweed and sea anemones. They offer 26 different carpet structures in 96 colours, which enables customers to create virtually any variation they can imagine. Faded and stamped designs were popular at this year’s exhibition. A carpet made from sand? One artist from America transported red sand halfway across the world to create a carpet made of sand for an exhibition. The pattern of the sand was made from a stencil of the soles of shoes. The designer’s intention was to show that consumers need to tread lightly and consider our footprint on Earth’s natural resources. After the exhibition, she brushed away the pattern, effectively turning her sand carpet to dust. Many exhibitors showcased leading sustainable products. Next Generation’s BETAP range consists of a single chemical composition that makes it easy to recycle. Aquafil’s yarn is sourced from fishing nets so that their rugs are not only made from fully recycled materials, but are also fully recyclable. “Another product that is gaining a lot of traction internationally is SPC flooring, which is a new type of luxury vinyl tile (LVT). It is specially designed with the ‘Unilin’ click locking system and can be easily installed on different floor bases, regardless of whether the surface is concrete, ceramic or existing flooring. Stalgen showcased planks up to 6m in length. The grooving on the planks has actual indentation and saw lines, making it look extremely authentic. Within the LVT space, we also saw a lot of soft decors and designs being incorporated into these flooring products, as well as LVTs that were indistinguishable from other materials such as terrazzo and marble,” says Marlene. 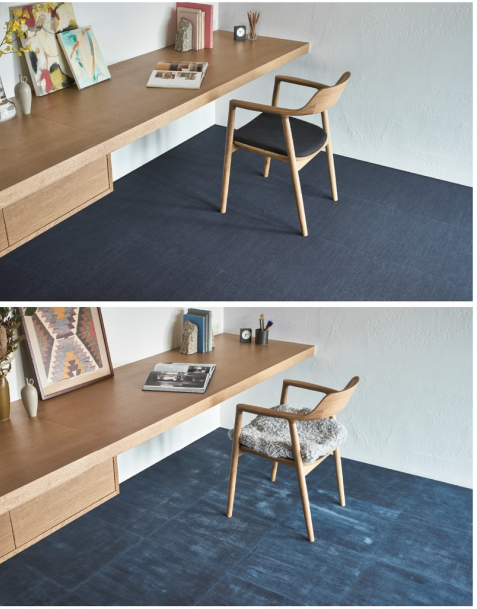 Japanese manufacturer, Tajima, showcased an LVT flooring product made from denim. Like denim jeans, the more it is worn and washed, the lighter the denim will become. One product that caught our attention was Granorte’s award-winning range of floor and wall coverings. 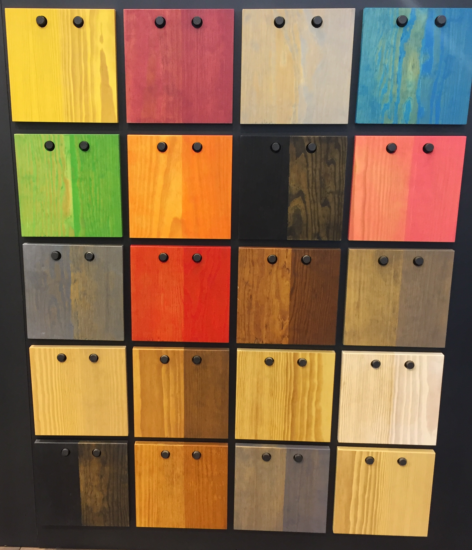 Their theme for 2019 is “colour” and their beautiful cork products are available in green, orange, purple and black, among other colours. 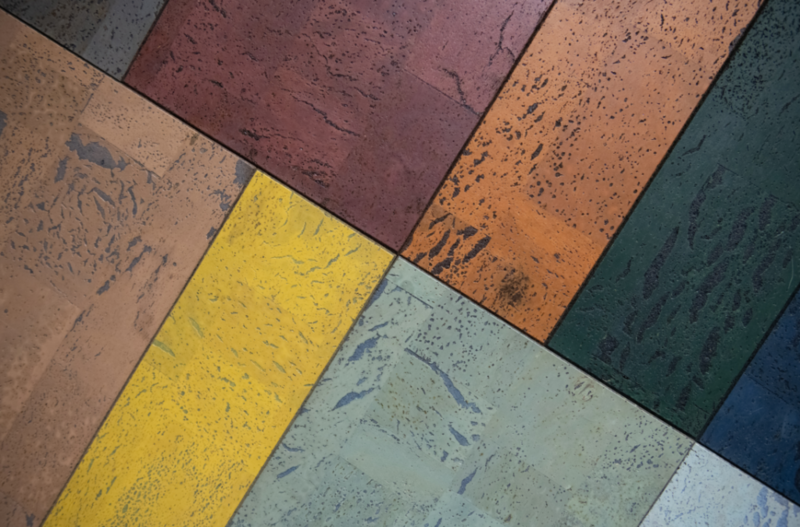 Granorte uses a digital printing process to produce cork floors that look like copper, snakeskin, stone, marble, charcoal and other materials. 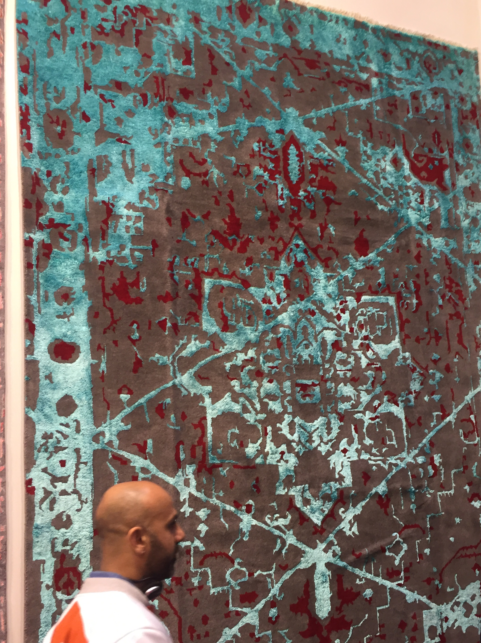 Also on show were metallic yarns as well as products with a more understated sheen, such as the “Ghom Copper” carpet from Hossein Rezvani, “Reflections” from Art Resources and “Argent” from Choudhary Exports. 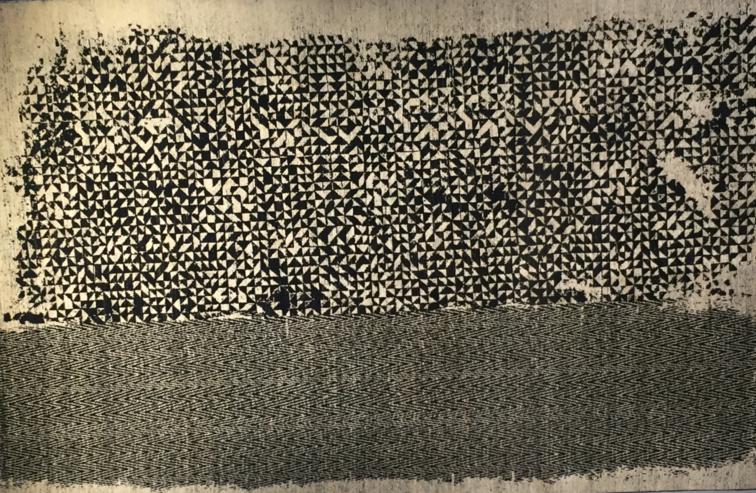 New wool carpet collections from Creative Matters such as “Veil” featured silver-gray tones. Parquet flooring is still a big trend in the industry. From herringbone patterns and gold inserts to chevron, geometric shapes that resemble leaves, and colourful ensembles, designers continue to impress in this sphere. Rubio Monocoat is a hybrid wood protector and a genuine “monocoat”, suitable for colouring and protecting all exterior wood in a single layer. It has 0% VOC and is available in breath-taking cream colours. Highlights among the application and installation techniques on show included labour-saving and intelligent products. “Uzin NC 111 BiColor” is a plaster compound for the preparation of smooth base surfaces provided by Uzin Utz. The compound changes colour from bright green to salmon pink when ready for application. SELIT Dämmtechnik displayed its new “Selit Style” product – laser-printed strips that can be matched with the floor using an innovative printing process. 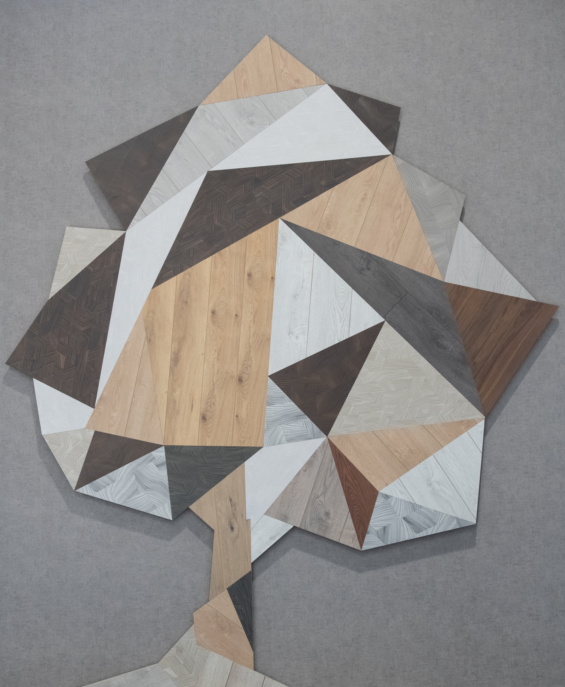 Framing Trends – a special exhibit at DOMOTEX 2019 devoted to all aspects of the CREATE’N’CONNECT lead theme, served as the creative hotspot for the overall event. It provided the main forum for presentations and debates on the megatrend of connectivity and was a standout attraction for architects, interior designers and influencers, among others. It consisted of the following three modules: “Flooring Spaces”, devoted to presentations of innovative products;”NuThinkers”, featuring a selection of university design projects; and the highly original art installations featured in the “Art & Interaction” space. Total Tool Milano’s “Wood Lifecycle” exhibition drew a large crowd. 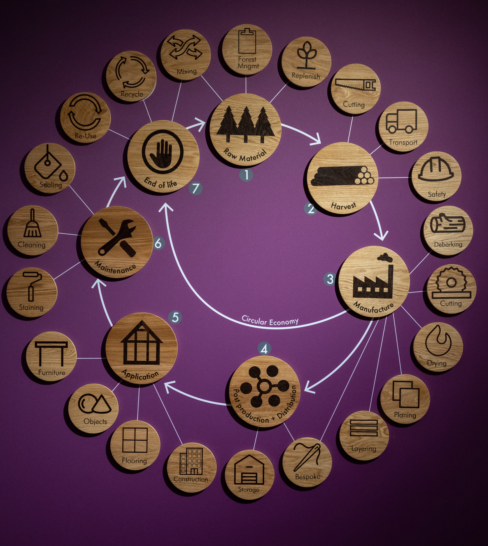 The project featured the “lifecycle” of wood in seven distinct steps – from the tree growing in the forest to the recycled product which completes and closes the cycle at the other end. Every point on the cycle of the connective display featured products from the company. Schmidhuber showcased a “connectivity wheel”, made up of coloured glass facets, and invited tradeshow visitors to enter the wheel and set it in motion with their footsteps, thus generating multi-coloured light reflections on the surrounding floor coverings provided by Carpet Concept. Leap Tools from Toronto displayed its “RoomVo” visualisation technology, a tool that allows users to upload their interior space photographs directly to the website of a manufacturer or supplier – no app required – and simulate the look of the selected carpet tiles, wood planks or design floor coverings.